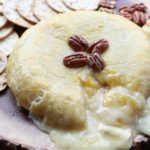 This golden brown baked brie in puff pastry is oozing with cheesy goodness and apple cider ginger jam! It’s the perfect holiday appetizer! Preheat the oven to 400 degrees. On a flour-dusted baking surface, roll out the puff pastry dough until it’s about 11 x 11 or 11 inches round. It doesn’t have to be perfect! Sprinkle with flour so the dough doesn’t stick. In a small bowl, mix the apple cider jam and grated ginger together. Spread the jam evenly on the top of the brie only. Flip the brie wheel over and place it in the middle puff pastry dough (so the jam is on the bottom). Gather the sides of the puff pastry dough to wrap it completely around the top of the brie. Flip it back over and add a few pecans to the top for decoration. Brush the brie all over with the egg wash. Place on a pie plate or small baking sheet and into the oven for 35 to 40 minutes, until golden brown. Remove from the oven and let cool for 10 minutes before serving. Serve with your favorite crackers. You can use whatever jam you’d like with this recipe! You can also leave off the nuts or add your favorite nuts.